When we first launched Appcues, all we really cared about was getting feedback from the people who had signed up for our product. We were not very focused on moving users from their trial to a paid subscription. But as we matured as a SaaS business, we found that people were spending an inordinate amount of time trialing our product, which we believed to be a simple tool. Our priority turned toward getting those trial-users to buy faster and more frequently. At the time, customers were informed of a 30-day limit to the trial, but the limitation of 30 days was not actually enforced; it was merely stated in our email drips. After 30 days, the software would continue to work without restriction. The 30 day limit to our trials had no teeth. So we decided to build a paywall. Wait a sec, what’s a paywall again? A paywall requires a person to sign up for a paid subscription before using a product. It is typically implemented at the end of a free trial and restricts further access without a financial commitment. Paywalls were popularized by media companies such as The Wall Street Journal or the New York Times in order to limit free access to their product. SaaS companies have similarly adopted paywalls to move users from trial to paid or to encourage upgrades to freemium accounts. We hoped a paywall would encourage trial-users accelerate their buying process. To assist in this effort, we decided to shorten the trial duration from 30 days to 14 days. We figured our service had come a long way by that point and 14 days seemed to be an appropriate amount of time to evaluate a straightforward product. But we didn’t love the idea of a paywall that put a hard stop to the user’s experience. Especially because the 14 day limit was not truly an effective measure of value gained by our trial-users, and we felt that many users might have valid reasons to ask for more time to evaluate our product. 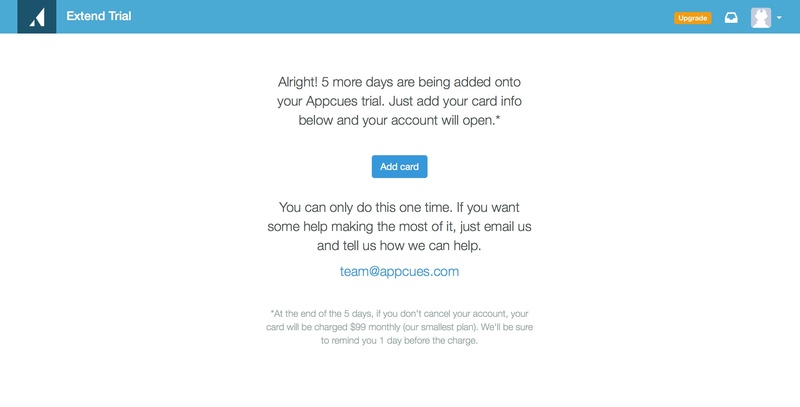 So we decided to include an option to extend the trial by 5 days with the input of a credit card. This bit of give-and-take helped soften the blow when hitting the paywall, while simultaneously validating the trial-user’s level of interest and moving them both physically and mentally closer to payment. Jackson Noel, our non-technical Co-Founder, took on the paywall for a hack night project. With a little help from Ray Di Ciaccio, one of our back-end developers, he built the paywall in under 3 hours. 1) Jackson created a single-step, required flow in Appcues that showed every time a user opened the app. 2) Jackson then targeted all users whose trial had expired, and we targeted the paywall to show on all pages of our app, except the billing and trial extension pages, to which users could navigate from the paywall. 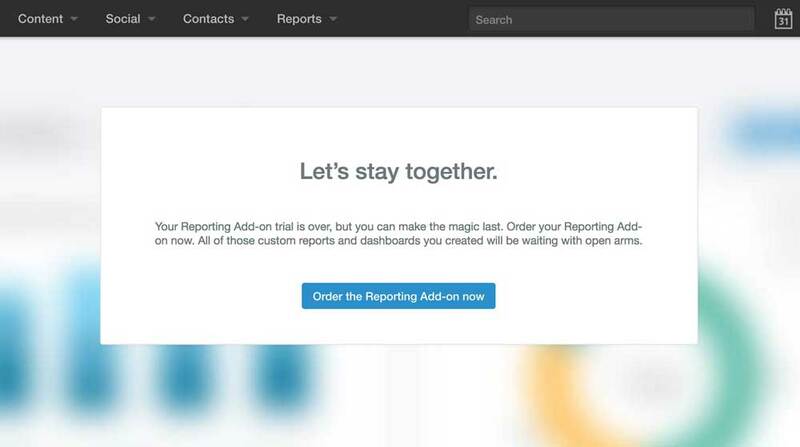 3) Jackson then built a page for trial-users that wanted to request an extension. 4) Ray added an account property to our database to mark trials as extended and added a Stripe form behind the “Add Card” button. 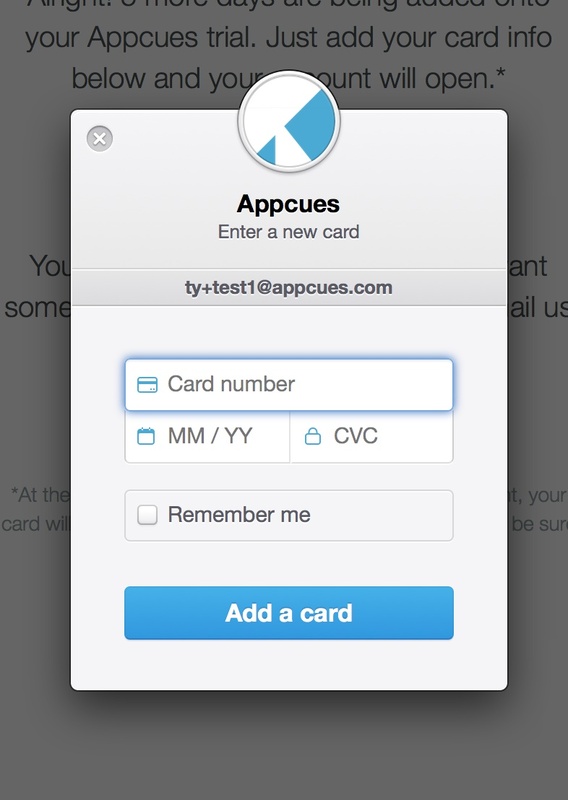 Trial extensions with a credit card converted to paid customers at a rate of 66%. This proves that those users who are willing to enter their credit card are excellent prospects for paid subscriptions. For those who weren’t willing to add their credit card for a trial extension, we allowed some to do so on a case-by-case basis. About 35% of extension requests came through email or support. These inquiries were usually from those who did not have access to their company credit card at the moment, or who were bullish on not providing that kind of information, despite our promises not to charge without additional consent at the end of the extended trial period. Since implementing our paywall, we’ve seen a 68% increase in the speed of sales. There have been many other changes and improvements to our product, marketing and trial experiences that may have influenced this metric, but this statistic is a factual representation of the gains we’ve realized. The increase in paid users is something we will continue to build and improve by other means, and it’s contributing to the upwards curve we’re seeing in our sales metrics to date. You can get started quickly with this template we’ve created. With a bit of customization on the front-end—which we are happy to help you with—and potentially adding a few account statuses in your database, you too can have a functioning paywall in just a few hours. Once it’s up, the best part about using Appcues is that you can iterate your content quickly and easily.